At least 1,500 stray dogs roam the Navajo Reservation alone. 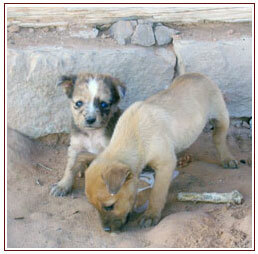 According to one estimate, there are at least 1,500 stray dogs roaming the Navajo Nation alone. But the number may be four times this much. And there are hundreds of stray cats as well. These circumstances prompted an urgent plan to care for as many reservation animals as possible. The answer is ROAR (Rescue Operation for Animals of the Reservation). Through ROAR, our Program Partners are provided with basic supplies to aid in their care of stray dogs and cats on the reservations. ROAR also helps fund mobile spay and neuter clinics. ROAR takes care of our Program Partners who, in turn, take care of stray and orphaned animals...place them in foster care...and get them ready for adoption into loving homes.